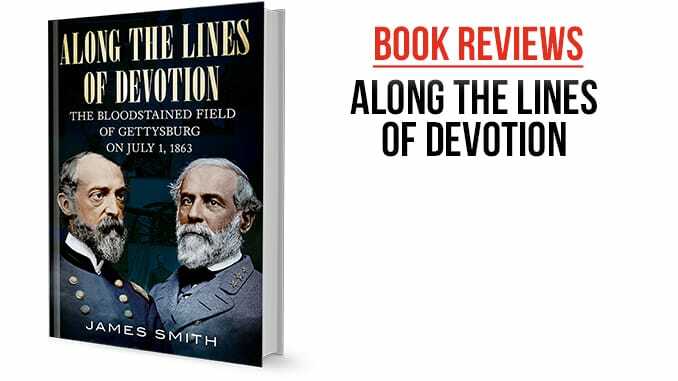 In Along the Lines of Devotion James Smith attempts to narrate the first day of the climactic Battle of Gettysburg fought between the 1st and 3rd of July 1863 between the Union and Confederate armies in the American Civil War. Unfortunately, Smith treads ground very well-worn by better historians and is horribly let down by his publisher. After a brief statement of intent for his book, Smith summarizes each army’s organization, ranks, artillery, small arms, and mascots, the inclusion of which raises questions about the book’s structure almost immediately. He continues with a background narrative of events leading to the climactic battle in Pennsylvania. Smith follows that with a detailed narrative, divided into several chapters, of the encounters round the town of Gettysburg on 1 July 1863, and that is capped off with a brief conclusion of what that day meant for those involved. Smith’s footnotes and bibliography are impressive, revealing considerable knowledge on his part. However, while Smith’s enthusiasm for his subject is undoubted, Along the Lines of Devotion is weakly written, atrociously edited, and proofreading was apparently omitted altogether – at one point, I wondered if I had become dyslexic! And how can you miss a typo on the back-cover description? It is also not clear what Along the Lines of Devotion adds to the considerable canon of works on this the most famous battle fought on American soil, particularly when H.W. Pfanz covered the same events so well only a few years ago. For wargamers interested in Gettysburg, Stephen Sears’s Gettysburg is still the best overview and Pfanz Gettysburg-The First Day is a must for that first day. Otherwise, unless you are a serious collector, this is not recommended.